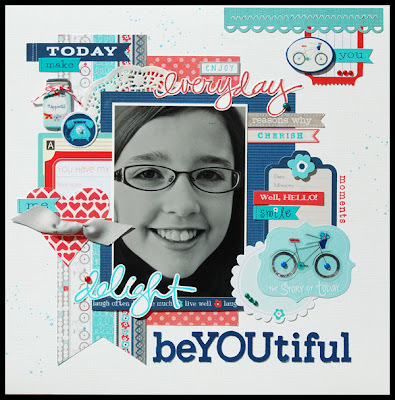 Just a sweet page about my sweet girl using Little Yellow Bicycle's Just Because collection and one of their new stamp sets (love, love, love). Don't forget that you have until Friday to comment on Monday's blog post for a chance to win some of Little Yellow Bicycle's new Naturals. This is beautiful!! I loveeeeeeee the colors and love love love the little bicycles!!! totally love the title work on this one! just awesome!!!! So nice! I love that this line is red/white/blue but gives a different feel that 4th of july only. I love all the layers you have created..that is something that really catches my eye lately! ooooooo beautiful. love the colors. they blow out the white. yum! The red and blues on the white are so striking! And such a great photo of her! This page definitely matches your title, Lisa!! Gorgeous use of the LYB, and I love how all of the Reds & Blues mix together. And all of the different paper pieces look really awesome behind your b&w photo!! this is so sweet! I love your use of that collection! This looks fantastic with the black and white photo! Love it! Oh this is wonderful, love how you did that title! I love how you did your title! You really rocked the LYB line! Hi Lisa - Lovely layout! Love your pretty dd's picture and all the layering. My favorite part is the heart on the left with the ribbon! Great job. I just love the colors in that collection, they go together so beautifully. This is beYOUtiful indeed! Love this pretty page and all the gorgeous layers. so pretty! I love all the white in this layout, it almost makes some of the layered elements look like they are floating! Very nice!! I love the colors and the word accents, especially your title!! Great page! I love the grey and the grey ribbon, knotted. Lovely touch! oh my oh my i love all that layering!! great page! I must be losing it ~ thought I commented on this:):) Your daughter has such a great smile and you really showcased that with this LO. Awesome Lisa!!! Beautiful layout, love all the layers and the color combo! Thanks for stopping by my blog, leaving some kind words and becoming a follower! I'm happy to be your new follower :D Have a beautiful day, hugs!! Really loving these colors you used! Beautiful page! What a fun and fresh page! These colors are amazing!